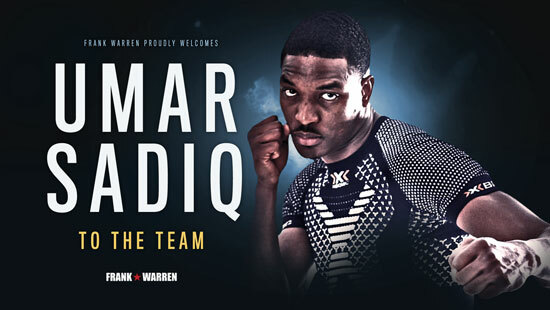 Top amateur star Umar Sadiq insists he is ready to hit the big time after signing a long-term promotional deal with Frank Warren. Londoner Umar has already had a taste of television when he played Anthony Joshua’s double in a recent television advert. And now he is confident of matching Joshua’s success at the highest level by becoming the next British Super-Middleweight to become a household name. He isn’t shy either and is already eyeing up the British title after being encouraged by sparring with World Champions James DeGale and Billy Joe Saunders. “It is time to take it to the next stage,” said Sadiq, who boxed for England and Nigeria, narrowly missing out on representing the African nation at the 2016 Rio Olympics. “I think five novice level fights and then I’ll be ready to start knocking on British titles. “With the confidence I have I believe I can achieve a lot in the professional game by winning major titles. Umar who graduated in accountancy at London Metropolitan University has also given up a highly-paid accountants job in the city to follow his boxing dream. The two-time Haringey Box Cup winner added: “I know what level I’m at and I can step up at anytime, people will realise that soon enough. “I bring something fresh, something different. I am not your typical fighter who just wants to talk about boxing. Details of Umar’s eagerly awaited professional debut will be announced in the near future.